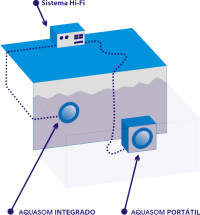 AQUASOM® is a solution for underwater sound in swimming pools, lakes or the sea based on underwater speakers from Lubell Labs, which can easily be integrated with standard audio equipment. Sound in the water: why ? In the water, in comparison to air, we feel sound in different ways, this is due to the fact that our body is mostly composed of water. The sensation one has is that the sound comes cristal clear from all directions at once - a natural Hi-Fi. The additional fact is that underwater the background noise in the air which surrounds us disappears. These features present us with a totally different way of listening and feeling music. The AQUASOM® solution is a perfect way to listen to your favorite music while you dive, swim or relax in your pool. With AQUASOM® you can enjoy moments of leisure at the sound of underwater melodies or dive into underwater festivals of music. This technology has been present in many international events such as the Olympic games from 1984 to 2004 for the event of synchronized swimming, in pool and open ocean underwater music festivals and in the production of a variety of films such as TITANIC, THE ABYSS, HARRY POTTER and many others. 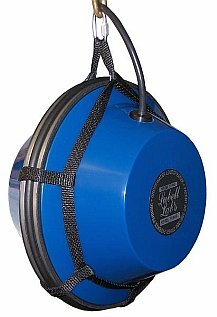 Model LL9484 - for newly constructed pools or under maintenance, for placement in walls. Download technical brochure here. Model LL916C (Cage) - for immediate installation and use, allowing a portable and flexible usage. Download technical brochure here. Model LL916H (Harness) - for immediate installation and use, allowing a portable and flexible usage. This is an economical version of LL916C. Download technical brochure here.